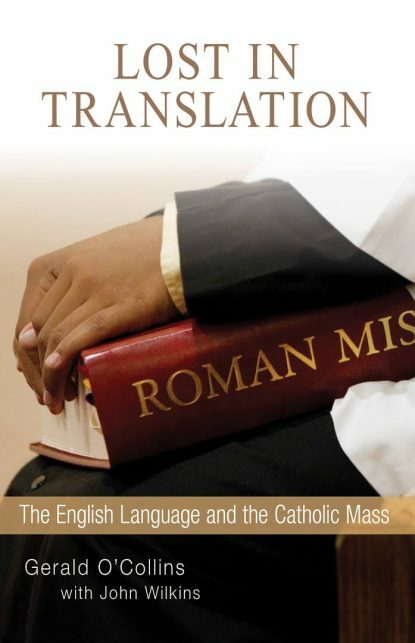 “Lost in Translation: The English Language and the Catholic Mass” by Gerald O’Collins with John Wilkins. Liturgical Press Academic (Collegeville, Minnesota, 2017). 122 pp., $17.95. Any Catholic curious about, or perplexed by, the current translation of the Mass prayers being used in English-speaking countries — including, of course, the United States — will find in this slim volume the best discussion of the topic currently available. It should be required reading for all clergy, particularly bishops. Here you will find an account of the political and ideological fancy footwork that ended in the rejection by Vatican authorities of the never-released 1998 translation of the Roman Missal. This translation was approved by all the members of the International Committee on English in the Liturgy but ended in its being abandoned to a probably locked cupboard someplace in the Vatican. Along the way, the authors build a strong case for the superiority of the 1998 translation. They also provide a solid critique of the translation we have been living with since the first Sunday of Advent in 2010. Finally, the authors briefly discuss Pope Francis’ personal edict of September 2017, in which he returned to national conferences of bishops the responsibility and authority for translations of liturgical texts, including the Roman Missal. No one should doubt that the authors are qualified to write a book such as this one. Jesuit Father Gerald O’Collins taught for many years at the Pontifical Gregorian University in Rome and is now an adjunct professor at Australian Catholic University and at University of Divinity in Melbourne. John Wilkins was editor of the London-based international Catholic weekly, The Tablet, from 1982 until 2014. To read this excellent, captivating and thoroughly honest book is to become as well informed as possible about why all Catholics should hope deeply that the current English translation of the Roman Missal will soon be consigned to the dustbin of history. It supports the desire of many that the 1998 translation will be found, dusted off, given a refreshing once-over, then given its rightful place in the liturgical celebrations of the English-speaking church. Finley is the author of more than 30 books of Catholic popular theology, including “What Faith is Not” (Sheed & Ward) and a revised/updated edition of “The Rosary Handbook: A Guide for Newcomers, Old-Timers, and Those In Between” (Word Among Us Press). Yeah, just what we need to go back to a translation which is devoid of beauty, clarity and accuracy. Let’s not go back to the 70s. If you want to place the current translation to the dustbin, let’s just use Latin. It’s simpler rather than to endure this nonsense. Well said, Fr. McKale. The Diocese of Pittsburgh recently announced its intention to close half its parishes. Rationalization and subsequent mergers/closures continue within the Archdiocese of Philadelphia. Nationally, mass attendance continues to decrease. Given the aforementioned and, keeping in mind how many years were required to bring the current translation into use, one has to wonder if this is really the best way to utilize resources? For the reasons that you mentioned, while this translation is a clear improvement relative to its predecessor, it would seem that the better action is to determine what with the liturgy or, the institution at-large has caused so many to stop attending.